What’s the easiest way to copy the content from one campaign to another? 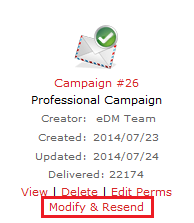 If you want to modify a campaign that has already been sent you can click on the “Modify & Resend” link (see image below). This will take you to the “Contact Selection” screen where you can move back and modify the content and any other aspects of the campaign. This is useful if you want to resend a campaign very similar to one that has already been sent. You can copy the entire campaign by going into the campaign content screen and in the WYSIWYG there is an icon that is called “HTML” – highlighted in the image below. When you click on this icon, a window will appear with all of the HTML content – copy all of this content into notepad. Then you can go into the campaign you want to place the copy of the campaign into and go to the same HTML button (as above). When this window pops up it should be empty. What you then need to do is copy all of the text within the notepad file into this window and press “update”. You should now see the content from the campaign you have copied.